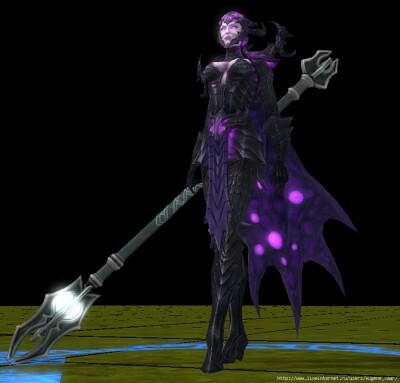 Just a thought: Since Haven had Glories (which were like Light Elementals), and Sanctuary had Spring Spirits (which were like Water Elementals), I would consider the possibility that they would reuse the Darkness Elemental model for one of the Dungeon Elite creatures. Even if this shoudl no be forgoten, I think Ubi had enought negative featback with Glories and Mizu kami that they will hopefully take a leson and avoid it. There is a high probability that Cate's model will be used for the black dragon, this could actually be accepted. Another Elemental copy on the other hand would only start a fanrage and bad feedback. I approve of Properkheldar's purposal. This is how I would imagine the dungeon faction. Even if the matriarch actually would be a hero. A Spellcaster, should be there, the Faceless can substitude it, but even so, there should also be an Elit darkelf. The naga are the faction with the most variable set of creatures. But even they have 2 nagas, Once core and one elite. This should also be in the darkelf setup. @ War-overlord. The only option I see now, how the Minotaur could became an elite, would be if the Faceless was a Champion. But since most people agree that the BBBD wil be the one (Big bad black Dragon), i just can't see how this could be right now. Minotaur is un my mind the perfect heavy core hitter, like the Crusher or Wamizane. But all we can (and will) do now is speculate. I just hope Ubi wont be the "Save all you can". In the worst option. we would have a "Small Dragom, Faceles, Darkness elemental recolor and Lamasu recolor"
I'm just a Mirror of your self. We see, we look, we gather, we store, we teach. We are many, and you can be one of us. Edited by samir at 21:41, 07 Oct 2012. I hope there won't be a dragon on top, I hope the faceless or the hydra will be the champion. I hope they can be more original and skip the sorceress-too much darkelves units and be more original. And rebringing shadow elementals into this faction would be kinda cheap, or won't it? I hope they can be more original and skip the sorceress-too much darkelves units and be more creative. it will be cheap like the water elementals and the light elementals have the same model with spring spirits and radiant glories respectively! yes i think dragons are kinda over here, faceless looks like the new champion for me! as for the dark elves don't forget that the dungeon in ashan is all about the dark elves. i think two units of dark elves would be fine. more creatures from the H3 dungeons and maybe a witch or an assasin for the H5 legacy? Edited by samir at 21:43, 07 Oct 2012. Hi Chris thanks for reply to me! I don't like more sexi female units, as tehre are so many of them in the original game, I think they should make the dark elves male or maybe pick troglodytes or other creatures instead. still elves are known for the equality of gender! hahahah! i think one witch wouldn't make a difference. i mean half of the dungeon creatures seem genderless if the compenduum is right (manticore, minotaur, beholder, faceless, and lets hope hydras) so the two remaining units would not be both female. Cate's model for Magic Hero maybe? and to all those who have problem with the color purple, we have an excellent modder here who i think if asked nicely would be willing to help. my personal opinion is that i like purple and it suits them just fine! With a Black Dragon as Champion, Elite tier can be populated by Minotaurs(Heavy hitters), Manitcores(Flying Assault+Poison) and Faceless(Magic/Casters). Leaving the Core tier for the Shadow Lurkers(Magic-Melee), Crossbow Archer Dark Elves(The compendium goes on and on about how DE's love their Crossbows) and a Second Dark Elf (Light Melee) . It can be doable. Dark Elves aren't that Numerous, as they've only recently moved to Ygg-Chall and that after 2 devastating wars. In some ways they are still like Elves and Elves never inhabited higher tiers. This is from the Forge April Fool's joke. 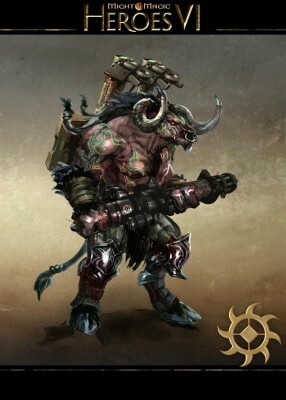 It's probably what the Minotaur will look like... except without the machine gun... and the jetpack. Which rather shows, and I've been meaning to bring this up, how long this expansion has been in the planning and/or making. And given the original "6 factions vanilla+3 other factions later" is not surprising. Academy certainly, vestiges of this faction have been datamined out of the game-files. I think Dungeon was meant as the expansion faction from the beginning. But let us not forget why the game was rushed to release. Yes, Ubisoft rushed the game and yea, that was done to create revenue. But the reason that this revenue was "needed", was not out of money-grubbingness. It was because Black Hole was messing up. They were missing their deadlines, going over budget and in the whole project overestimating their own capabilities. BH's bankrupcy was foreshadowed long before it happened. So the rush was done to minimize the losses instead of flushing the whole project down the toilet. Edited by blob2 at 12:08, 08 Oct 2012. It was because Black Hole was messing up. They were missing their deadlines, going over budget and in the whole project overestimating their own capabilities. BH's bankrupcy was foreshadowed long before it happened. So the rush was done to minimize the losses instead of flushing the whole project down the toilet. So the question is: why Ubisoft made a decision to entrust such a beloved franchise into their hands? They have many other, more capable game developers to choose from I believe. Just an example, the final story script - which was UBI responsibility - was delivered to BH after 27 months... while originally there was 24 months for the whole development. No comment. So it seems there was a general lack of communication going on. And judging by Ubi's past rep, that's not entirely surprising. Well, that is exactly the point. Heroes is a niche market. A rather big niche perhaps, but a niche still. Heroes isn't a AAA-Franchise, so it does not get AAA-budgets. It has to make due with a smaller budget because otherwise there would be no profit margins. Which is also the reason why the development is outsourced to smaller/cheaper studios. Instead of the inhouse development the AAA-titles warrant. I have little doubt that there were mistakes made on both sides of the "BH-UBI conflict" and that both sides deserve an ammount of blame. However, you've hit the nail right on the head. "The alleged ex-Black Hole employee wrote.." We have no credentials for this person. And the fact that he presents himself as a disgruntled employee, makes any agrument he makes practically per definition lopsided. Also, those who have been in the multiply extended BETA have seen that the process then was extremly slow. Which favors the argument that BH was in over its head. That being said, the process is still slow now, with Limbic. Though that has to be augmented with the details that they are working on other peoples code and AFAIK their team is smaller than BH's was. Edited by Anna at 14:38, 08 Oct 2012. I know there's too little info as of now but I want to ask about that "standalone" stuff. I get it I won't need H6 vanilla to play the expansion, but is it going to have just 1 campaign? Are the vanilla skirmish maps going to be included in it? Are there going to be new ones? I mean what is it going to be like purchasing 1/6 of the vanilla content or it will have enough content in it to make it worth leaving H6 on the shelf?